Keyword tracking is important to your SEO strategy. At Pagezii, we understand that. So we created the keyword position graph to help you visualize your keyword performance. And in this post, we’ll cover the keyword position graph in detail. Within Pagezii’s SEO Analysis Report, you’ll find a keyword position graph. The x-axis of the keyword position graph represents click-through rates (ranging from 0 – 100 percent). The y-axis represents keyword position (ranging from 1 – 10). The keyword position graph displays three colors to represent above, on-par, or below average keyword performance. And the dots scattered across the graph represent your keywords. When you hover over a dot, you’ll see the keyword it represents, along with its average position and click-through-rate. With this in mind, you can now analyze your keywords from a bird’s eye view. And the data that Pagezii uses to build this graph is taken directly from Google Search Console. Your goal is to see keywords performing above average for the position by click-through rate. This translates to keyword plots falling within the green area of the graph. 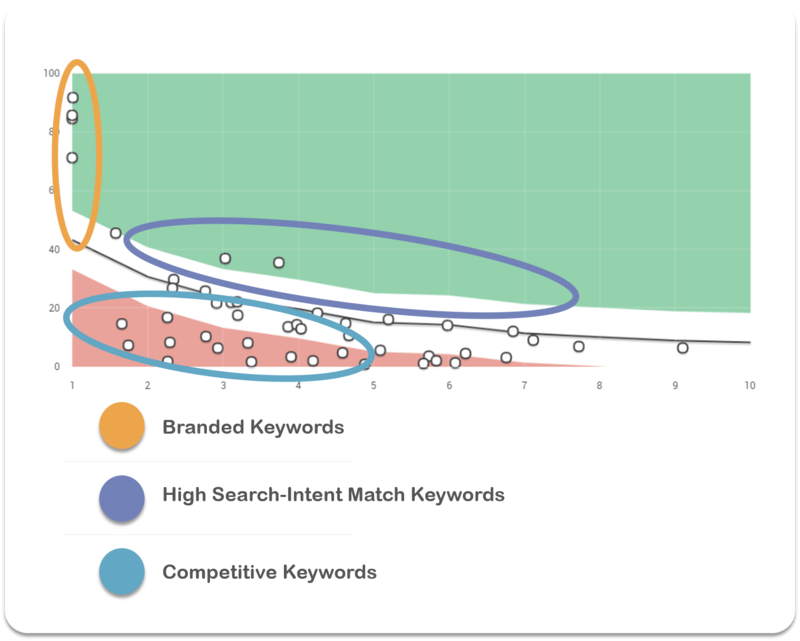 Keywords falling within the white area of the graph represent on-par keyword performance. Anything falling within the red area of the keyword position graph represents under-performance. 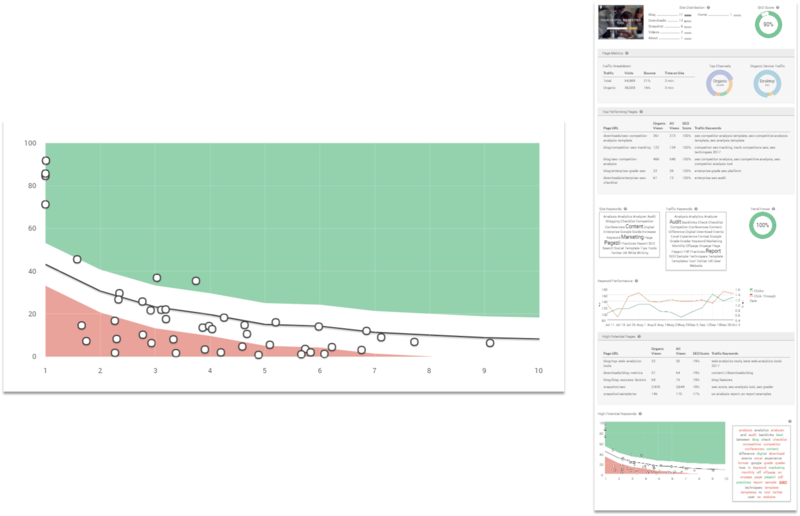 …But now that you’re there, you want to push your keyword plots into the green area. And the best way to do that is optimizing your meta elements (page title and description) with these techniques. Use Your Target Keyword – Mention target keywords early on in your page title and within your meta description. This provides searchers with instant recognition that your result is what they’re looking for. Watch Page Title and Description Lengths – Search engines only allow for a certain number of characters to show in your organic results. So to avoid truncation, make sure your page title is less than 60 characters, and meta descriptions are less than 140 characters long. Use a Call-To-Action – Once you gain a searchers attention, don’t let it go. This is where you can use a call-to-action to make sure they follow through on the click. An example of a CTA could be: “sign up today”, “learn how to…”, or “download report”. You now know how Pagezii’s Keyword Position Graph works. But don’t stop here. 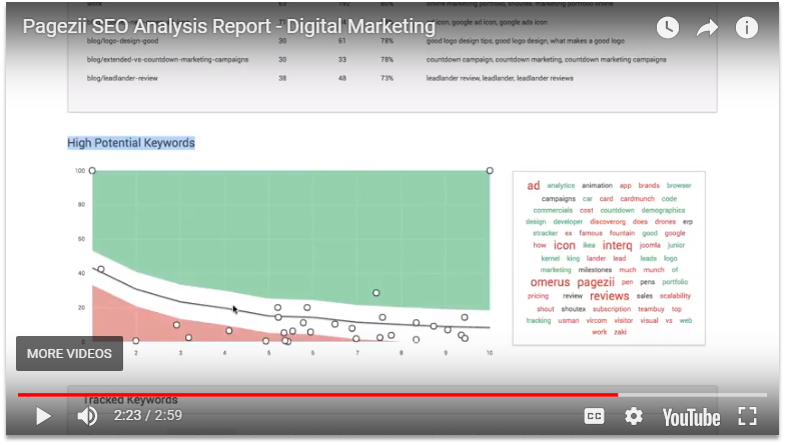 See the full power of Pagezii’s SEO Analysis report in this quick video tutorial.